Nettl is the new name for printing.com. For the past six years Raphael Design has been proud to be a franchisee of printing.com. Throughout this time, many of our clients have benefited from the innovative and cost effective print products that are within the printing.com range. printing.com is changing! To complement its print products, it has developed a comprehensive range of website solutions from brochure sites all the way through to e-commerce systems. All of these are available under the Nettl brand and you can access all these products at Raphael Design in our Nettl Studio. Recently, the most significant trend in the online world is the number of websites that are being viewed on mobile phones or tablets. At present 52% of website visits are made this way* and this trend is gathering pace everyday. In addition, since April 21st 2015, where searches are made on mobile devices, Google is giving preference in its results to websites that are mobile compatible. The simple reality is that if your website is not mobile compatible, and there are many sites like this, you risk turning customers away. So why not take the mobile responsive test? WHAT DO YOU DO IF YOUR WEBSITE IS NOT MOBILE COMPATIBLE? The easiest thing you can do is to contact us as we can help! 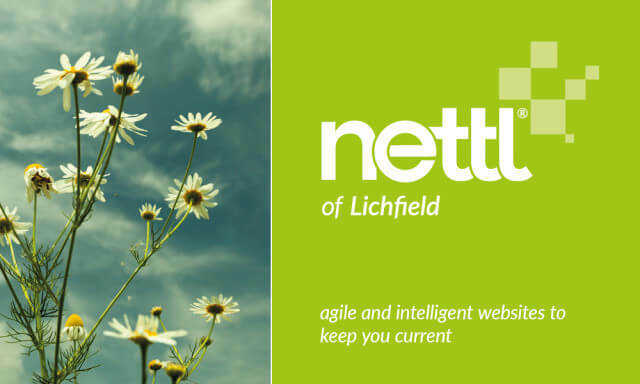 Here at Nettl of Lichfield we make beautiful websites and web shops that intelligently scale depending on the device they are viewed on. Perfect for your clients to view on a mobile device and perfect on a desk top too. WE CAN IDENTIFY THE WEBSITE THAT BEST SUITS YOUR BUSINESS NEEDS? In our initial consultation we will discuss the objectives for your site and your company so we can pick the right platform for you from the start. The consultation is free and without obligation. We know that every business is different and so is every website we create. We have a modular approach so we can get you online quickly and then you can upgrade your site in a structured way, when you are ready. This means your site will not become redundant; as your company grows your site can grow too. Give us a call on 01543 261220 to book a FREE consultation and we will show you how to get started.